Cats love the great taste and smell of fish. Salmon meal and herring meal are rich in omega fatty acids. These protein sources are highly digestible and help your cat maintain top condition and overall good health. Quality fish and animal proteins help build and maintain lean muscle mass. Balanced levels of calcium and phosphorus promote strong bones and teeth. Guaranteed levels of antioxidant nutrients like Vitamin E and Vitamin C blended with nutrient-rich vegetables and fruits such as peas, apples, blueberries, carrots, spinach and cranberries help support the immune system. Made without grain or gluten, this special formula is perfect as a grain-free alternative diet. 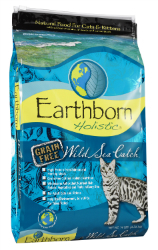 It is highly digestible with tasty proteins and a great natural fish flavor that cats love. 3,895 (M.E. Calculated, as fed) Kilo-Calories per kg/425 (M.E. Calculated, as fed) Kilo-Calories per cup.